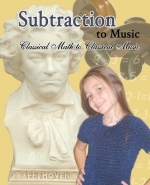 Now we are proud to offer your children, "Classical Math to Classical Music-Subtraction." Experience classical math education and classical music education– all in one program! Every well-educated child should know something about the greatest music ever written–-Classical Music. They should know about the people who wrote that music. They’ve probably heard names like Bach, Beethoven and Mozart. But there are many other classical composers whose music they’ve heard but whose names they do not recognize– names like Pachelbel, Rachmaninoff, Clementi, Vivaldi, and Gounod. There are even English sounding names like Elgar and MacDowell. These songs put the subtraction facts to music–-not just any music–-but the timeless melodies of the great classical composers. While almost everyone memorizes the multiplication tables, very few children take the time to memorize their addition and subtraction facts. Instead, they tend to “count on their fingers” to arrive at the right answers. But it’s just as important to quickly know “8 minus 3” as to know “8 times 3. ” With this program, they’ll hear these facts to great music such as “Pachelbel’s Canon” that you hear at weddings or Edward Elgar’s “Pomp and Circumstance” that you hear at graduations. You’ll gain a new appreciation for great classical music. Not only will you hear and appreciate their music, you’ll also learn about the composers themselves! Then, you’ll reinforce that learning with clever crossword puzzles about those composers. Our proven program presents each song four times. The first three times, your children will hear the answers. The fourth time through, your children will “sing in” the answers. This method of learning utilizes the time-tested method of repetition, repetition, repetition. It builds confidence, enabling your kids to remember these facts for a lifetime. Get ready to journey into the timeless world of classical music with Classical Math to Classical Music. You and your students will treasure the experience always. Chopin’s "Waltz in E flat"
Rachmaninoff’s "Piano Concerto #2 in C"
Clementi’s "Sonatina #1 in C"
Puccini’s "Quando Me’n Vo" from "La Boheme"
(Theme Song of "Alfred Hitchcock Presents"
Vivaldi’s "Autumn" from "The Four Seasons"
MacDowell’s "To a Wild Rose"